bl.uk > Online Gallery Home	> Online exhibitions	> Asia, Pacific and Africa Collections	> St Joseph's Church [Lucknow]. This photograph of the St. Joseph's Church from 'The Lucknow Album: containing a series of fifty photographic views of Lucknow,' was taken by Darogha Abbas Ali c.1874. 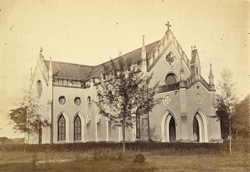 The Roman Catholic Church of St. Joseph was built in 1860 by Father Raphael of Livorno at the instigation of Catholic troops stationed at Gorakhpur during the 1850's. It is the fifth oldest Catholic church in Uttar Pradesh.